A beet salad with goat cheese has become ubiquitous on restaurant menus and a favorite throughout America. This version is a bit different, using the beet greens as well; most people think of only the beet bulb, but the greens are as delicious and nutritious as the root, and this is a great way to use them in a salad. 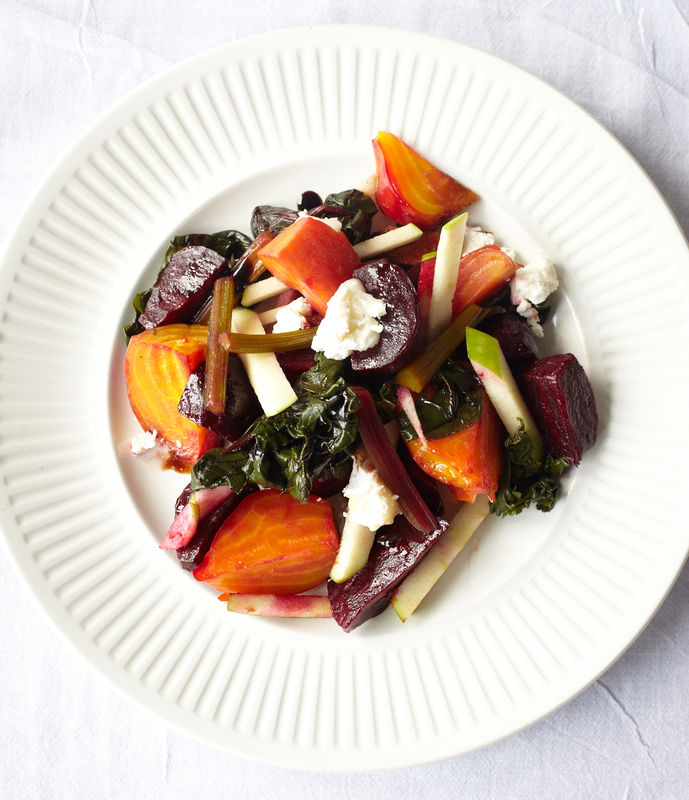 It is best with small, firm beets and fresh, unblemished greens. Make sure you have a crisp, tart apple, and really crumbly goat cheese. Roasting the beets to intensify the sweetness yields the best results. Slice the greens off leaving a tiny bit of stem on top of the beets, then scrub the beets and poke each of them with a fork a few times. Put them all in a shallow baking dish, uncovered, with an 1/8 inch of water covering the bottom. roast the beets— the water will actually steam them a bit first— until they are shriveled, dark, and caramelized outside, and tender all the way through (when poked with a knife)—45 minutes to 1½ hours, depending on size. Let them cool completely. Rinse the beet greens well, trimming off the tough parts of the stems, and cut the softer stem pieces from the leaves. Bring a big pan of water to the boil, then drop in the stems and cook for about 10 minutes; now add the greens. Cook for 20 minutes more, or until the stems are quite soft. Drain in a sieve; sprinkle ¼ teaspoon salt over the hot greens, and let them cool. Peel the cooled beets, removing all the skin, the stem base, and the root tip, exposing the gleaming flesh. Cut in wedges, and place in a big mixing bowl. Cut the greens (both leaves and stems) into 2- inch lengths, and toss with the beet wedges. Whisk together the oil and vinegar, with the remaining ¼ teaspoon salt and some grinds of pepper. drizzle the dressing over the beets, and toss to combine. Core and slice the apple into thin matchsticks. Arrange the dressed beets on a serving platter or portion them on salad plates; fold in the apple pieces, then crumble goat cheese on top just before serving.